Today was the easiest back to school day in our history. Everybody was up and at 'em on time. Backpacks were organized and packed a few weeks ahead of time. Lunches were made the night before, ready and waiting in the fridge. New shoes had been purchased recently and were broken in just enough. 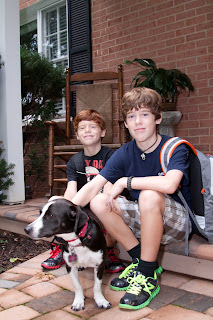 Even the traditional first day of school photo shoot went smoothly. No nerves to muck things up, as we may have sensed in prior years. Both boys were excited for the day ahead. The dog and I will be waiting to hear all about it this afternoon. Glad they were excited today! 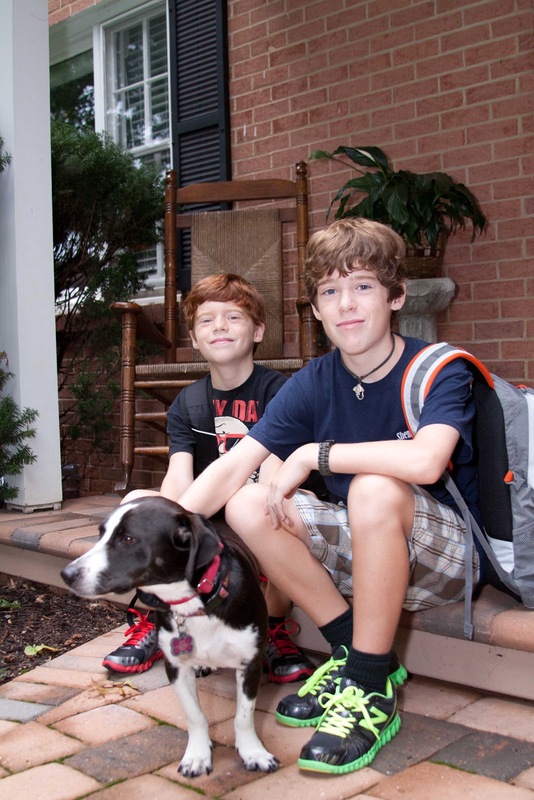 Hope you and Delta have a good first day just the two of you! Even if I didn't know you and we were not related I bet I could guess what grade #1 son is by the pose and the look : ) Suddenly he looks so grown up! Hope all went well today!